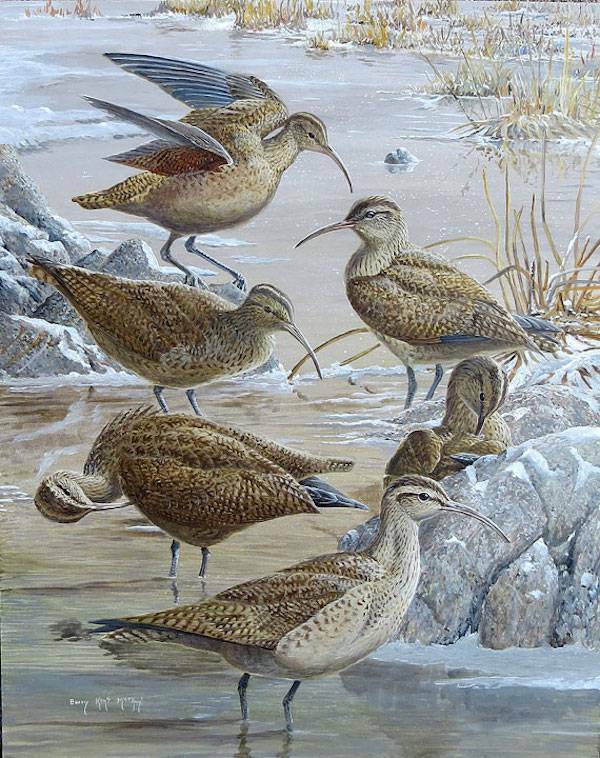 This painting shows a small curlew species, endemic to the western hemisphere, and, sadly, extinct. There have been no reliable records of it in the last half century, or so, and I think by now it is safe to assume none are left. The Eskimo Curlew used to nest in the Canadian arctic, its exact breeding range unknown, but presumably from Alaska east to what is now Nunavut. And in fact, this painting was done to illustrate a book on the birds of Nunavut, formerly the eastern part of the Northwest Territories. The Eskimo Curlew was once abundant, and killed by market and sport hunters in huge numbers during the 18th and 19th Centuries. They were highly migratory, and we know that in the summer they left their far northern breeding grounds and flew east, to the Atlantic coast, and then south, through the West Indies, to their wintering grounds in Patagonia. Then, in late winter or early spring, they would head north, taking a more direct route up through Central America and the prairies. Like other highly migratory shorebirds they would have accomplished some very long flights over untenable habitat such as open ocean, jungle, and high mountains. All of this is dramatically told in the novel, Last of the Curlews, by the late Fred Bodsworth, a dear friend and mentor to me when I was young. 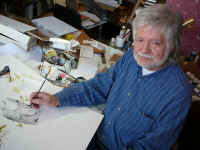 The original book was illustrated by wonderful scratchboard drawings by T. M. Shortt, also a friend and mentor, and, in my opinion, the finest bird artist Canada has ever produced, and a master of black and white, pen and ink and scratchboard art. I chose to show a group of the birds, showing very minor individual variations in pattern, colour and structure, newly arrived in the north. Usually they are illustrated as a single bird, or a pair, to empathize the tragedy of their loss, but I wanted to show them as they would have been in centuries past; a group of shorebirds, preening and feeding in a shallow slough somewhere near the arctic circle.